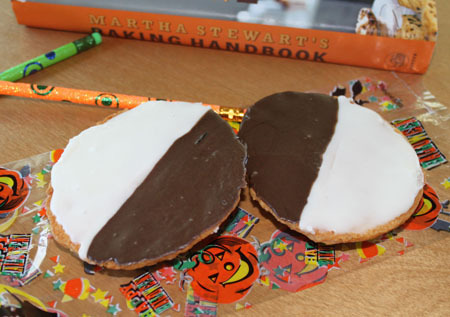 I love Black and White Cookies and have tried several recipes over the years including ones from Epicurious, Martha Stewart, Baked Bakery and another one from Salon. They were all good, but at the end of the day I’d have to say my favorite was this hybrid. The others were all very good in their own way — some denser, some crumblier, but my favorite is slightly cakier with a lot of flavor from vanilla and a hint of lemon. As for the icing, I really like the one I’ve posted, but if you have a better one let me know. My favorite right now! Cakier than the others and less crumbly, but moist and delicious. Less lemony and more kid friendly. Maybe. Only tested on one kid. Baked Explorations Very good cookie. Moist, but not too cakey. Had the lightness about it that one would expect in a Black & White, and lots of lemony flavor. 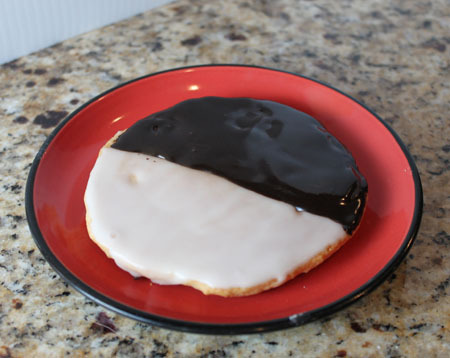 Salon.com Black and White Cookie Recipe This cookie tasted almost exactly like a New York deli Black & White, but after trying some other recipes with more butter, I’d choose them over this cookie. These did have a very crumbly, light texture, though. My mother loved them. Martha Stewart Baking Handbook Recipe This cookie was higher in fat than the others. It was richer, denser and very filling. Because the cookies are so rich, I think they’d be ideal as “minis”, but when made regular size, they’re almost too heavy. Stir together flour, baking soda, and salt in a bowl and set aside. Beat butter and sugar in a large bowl with a hand held electric mixer until pale and fluffy. Beat in the lemon zest and vanilla, then add egg, beating until combined. Add the flour mixture and buttermilk mixture alternately by hand until you have a smooth batter. Spoon 1/4 cups of batter about 2 inches apart onto a large baking sheet lined with parchment. Bake in middle of oven until tops are puffed and pale golden, and cookies spring back when touched, 15 to 17 minutes. Transfer with a metal spatula to a rack and chill (to cool quickly), about 5 minutes (or let them cool at room temperature). Add the cocoa powder and 1/2 teaspoon of water to the 1/3 cup that you measured out and stir until smooth. If the chocolate frosting seems too thick, thin it with a little water or milk. Transfer the frosting to disposable decorating bags that do not have the tip snipped off. You won't need a decorating tip. When ready to use, snip off the tip of the decorating bags and pipe half moons of each flavor over the cookies. Awesome, awesome recipe. My vanilla frosting was a bit runny, but I added some more sugar and it was fine. Thanks for posting. Your comparisons are the best! Lourdes, this recipe makes a fairly cakey (yet light) cookie. My dough was like very thick cupcake batter, though. It wasn’t dry like a scone. Did you accidentally use too much flour? Could you have packed it into the cup a little too much? Or maybe they just weren’t what you were expecting. Mine were very cakey. Were yours flat? Mine looked like muffin tops. The texture of the dough was more like a scone, than a cookie. What did I do wrong? I love it when you taste test recipes for us. 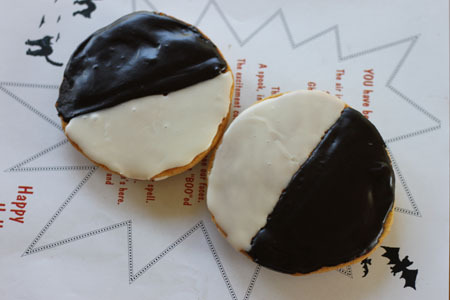 Next time I want to make black & white cookies, I’ll know where to come for a recipe! Thanks for doing the research, Anna — I’ll save this recipe! Stephanie, thanks for the heads up! I saw the episode and the cookie, but wasn’t sure they were going to post the recipe since it’s the second chocolate chip cookie. I see that they did! Woo hoo. Anna- did you see Bravo just desserts? another chocolate chip cookie to try! Yay black and white rundown! I need them all. In my tummy. I love when you do these comparisons. Been a crazy week, and I haven’t left many comments, but I have been stopping by. I don’t think I’d like the lemony flavor either. Thanks for taking the time to bake all these variations! 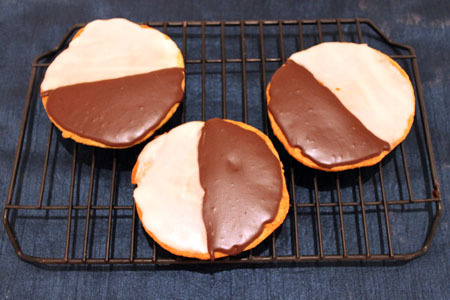 When I was growing up in Chicago, our neighborhood bakery had cookies that were very similar to black and whites, though I don’t remember them having lemon flavor. We called them “cake-cookies” and I just loved them! I remember the icing on these to be thicker, more like a buttercream (maybe they were being lazy and using up their extra cake frosting? or my memory might be way off) I could *either* get “black” or “white”, but not both together. The closest I’ve come to finding something similar is a vanilla whoopie pie recipe that I found, though I think I will try a couple of these (minus the lemon) to see if they are better. Now THIS looks like a true B&W! Less crumbly and more cakey is a very good description! 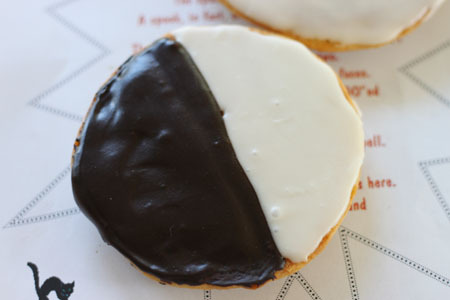 WOW, what an informative and useful table comparison for the black and white cookies. THanks so much for sharing! It’s good to know that you’ve tested and compared so many black and whites. When your Fiori Di Sicilia arrives will you make more or will you be tired of them by then? I would love to make these cookies…the only thing stopping me is the that they need to be iced with an offset spatula and the heavy cream which I don’t have. Your cookies look really good. Today’s cookies look great. I need to get myself some Valrhona cocoa asap.